“God’s Plan” joins “One Dance” to help Drake break another record. Drake has broken yet another record with "God's Plan," one of two singles he released at the end of January. The song has now reached its 10th week at No. 1 on the Billboard Hot 100, surpassing Elton John and Diddy to become the only solo male with two songs to spend 10 weeks at No. 1. He breaks the record after joining the ranking in 2016 with "One Dance," featuring WizKid and Kyla. 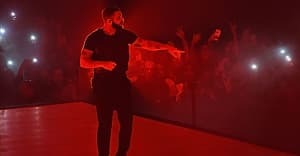 Billboard reports that Drake is the sixth act to spend at least 10 weeks at No. 1 more than once, joining Mariah Carey, Boyz II Men, Santana, the Black-Eyed Peas, and Pharrell Williams, for his own "Happy" and his feature on "Blurred Lines." Drake is the first male solo lead to join the club. Previously, the song broke Drake's own streaming record, and tied Drake with the Beatles for number of Hot 100 Top 10s in a single decade. According to an Instagram story captured earlier today by Complex, the song may be soon be followed up by a full album.